We are guest posting over at Mum in the Making today, talking about small spaces and reorganising of kid's room. I've been wanting to do something about "those 2 heaps of things" in DinoEgg's room but have been procrastinating, thanks to Justina of Mum in the Making for giving me that BIG push to start me going. 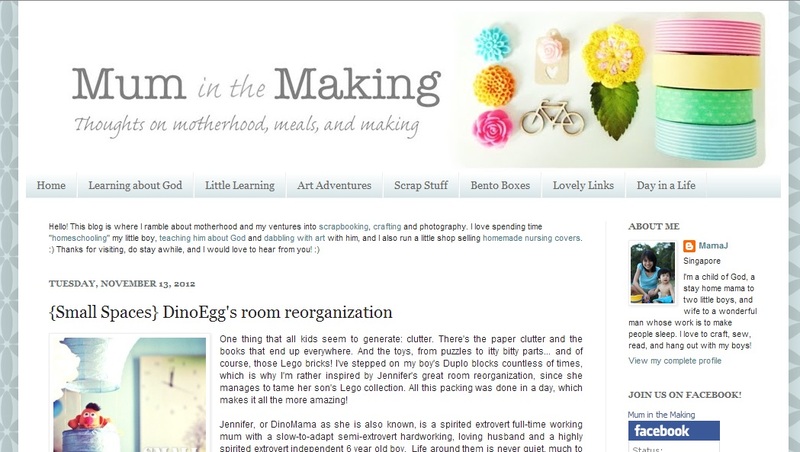 Hop by to read about my post DinoEgg's room reorganization and stay tune for other mummies who will be sharing their reorganising skills. Click the button below and it will lead you to all the guest posts on Small Spaces. I was there and saw your guest post. But my internet connection was craps I can't open the images hiks! Will be back to check again. I am sure it is lovely! I think you are supermum lor, being able to pack his whole room up in just one day! *big pat on back* Thank you for sharing over at the blog!